From his native Africa to the United States, tributes continued to pour in from around the world Sunday after UN chief, Nobel peace laureate, and “diplomatic rock star” Kofi Annan died at the age of 80. 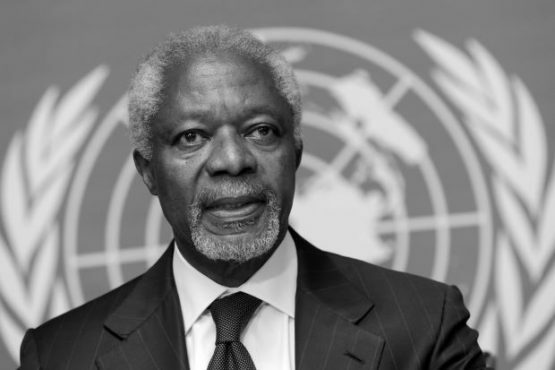 Annan, who lived not far from the UN European headquarters in Geneva, died in a Bern hospital, Swiss media reported. His foundation told the ATS news agency Sunday his funeral would be a private event, but did not provide further details. It said a separate UN ceremony would be held at a later date. Annan later admitted the scandal had sorely tested his mettle not only as secretary general, but as a father. President Donald Trump had yet to comment, but his Secretary of State, Mike Pompeo on Sunday hailed a life spent “advocating for peace and human dignity”. And US ambassador to the UN Nikki Haley said Annan “never stopped fighting for the dignity of every person”.